พระเยซูคืนชีพ — "Noli me tangere"
↑ An acrostic in the motet's text suggests Marchetto was the composer. ↑ Anne Derbes and Mark Sandona, The Usurer's Heart: Giotto, Enrico Scrovegni, and the Arena Chapel in Padua. Pennsylvania State University Press, 2008. ↑ The connection of the Annunciation of the fresco cycles and the feast is explored by Laura Jacobus, "Giotto's Annunciation in the Arena Chapel, Padua" The Art Bulletin 81.1 (March 1999), pp. 93-107. 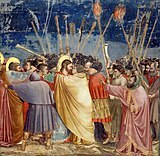 Giuliano Pisani, I volti segreti di Giotto. Le rivelazioni della Cappella degli Scrovegni, Rizzoli, Milano 2008 (ISBN 978-88-17-02722-9). University of Auckland most of the images, with explanations & highlighing named figures etc. หน้านี้แก้ไขล่าสุดเมื่อวันที่ 13 ตุลาคม 2559 เวลา 06:34 น.